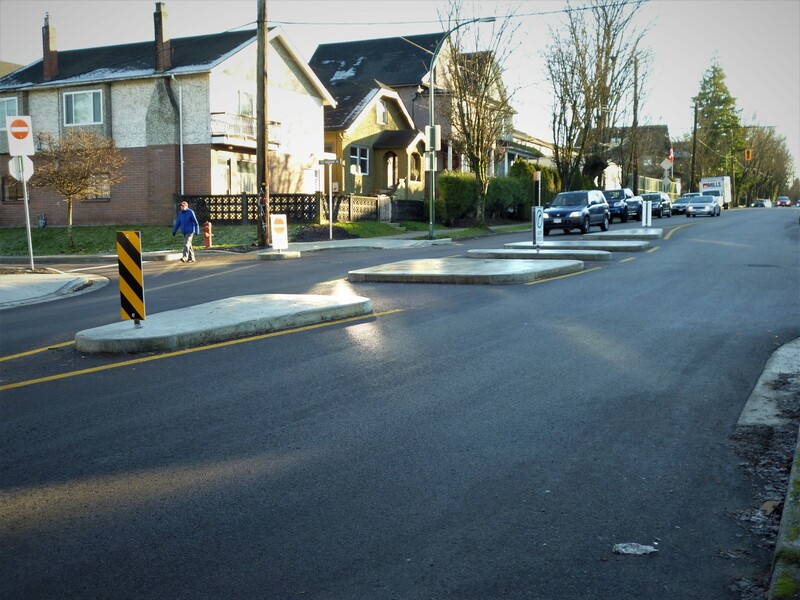 Further to my question the other day regarding the safety of the new intersection design at Victoria Drive & Adanac Street, I have received a response from Ross Kenny, Senior Transportation Design Engineer, City of Vancouver. “There is a plan for a painted crosswalk and yellow paint on the median, however, we are waiting for the weather to improve before our crews are able to go out and do the painting. We have heard a handful of complaints regarding the visibility of the median and we are following up with the installation of reflectors on the widest part of the median to make it more visible for drivers. There was also a short period of time after installation that the street light at the intersection was out, which has now been fixed. The design of the center median is based on a median design that was implemented 5 years ago at the intersection of Kaslo and Dundas Streets. There are a number of center medians that were installed on Dundas Street which is similar in character to Victoria. Generally we hear that the medians have made it easier to cross the street as pedestrians and cyclists only have to ensure that 1 direction of traffic has stopped before they are able to enter the road. They also cost significantly less than a traffic signal and have the added benefit of slowing traffic, which has been a long-standing request on Victoria Drive. I’ll be passing this on to the residents who wrote to me about this issue. Anyone who wants to respond directly to Mr. Kenny should write to him at Ross.Kenny@vancouver.ca. I will also keep a watching brief on this and please let me know of any further incidents. Is The Adanac/Victoria Median Dangerous? Yesterday I received an email from a local resident. She had found me after googling my earlier comments on the new bike-friendly traffic arrangement at Victoria Drive and Adanac Street. Victoria Drive looking south from just north of Adanac Street which crosses east to west. She went on to say that her regular auto shop thought a similar accident had occurred at the same median. Another resident, a near neighbour of the first, told her she had had to swerve more than once when approaching that intersection. Being neither a car owner nor a bike rider I have no dog in this fight over functional priority. However, I can attest to the dislike of the new arrangement by taxis and Handy Dart drivers, many of whom, coming from the south, now have to perform a four block loop to park near my house. I have also heard from driver friends of mine: “road is not wide enough”, “never designed for this stupid hazard”, “poorly lit”, and “hard to see,” are the typical comments. I guess this looked good on the maps to the bikeophiles at City Hall; but evidence on the ground seems to suggest this needs a more detailed look. How often are these decisions reviewed to see whether practice met theory? You are currently browsing the archives for the Victoria and Adanac category.